When Words Collide is over. I feel as if I’ve been talking nonstop for five days. I’m looking forward to a couple days in which I don’t need to talk at all. Perhaps I will communicate only by gesture. For those of you concerned about how best to spend your travel dollar, I can thoroughly recommend the trip to WWC in 2012. Though this was the first WWC, the con committee is very experienced, and they really know how to throw a convention. It was extremely well organized, and the events were varied and informative. If you’re all about books, this is the con for you. And if you’re invited to be a convention guest, my advice is to say yes before the committee changes its mind. They treat their guests very well indeed. I’ve been treated here as well as I’ve been treated anywhere, and perhaps better. 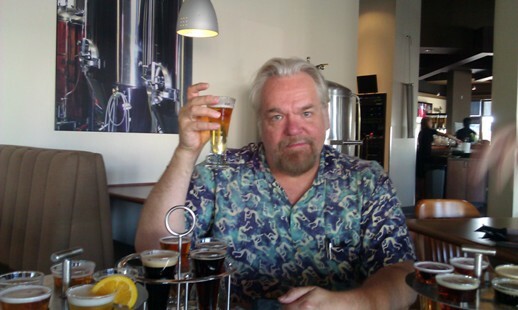 Here’s a picture of me after the convention, kicking back with the sampler platter at the local brew pub. Mellowness ensued. Have a wonderful time, sweetie! I’m glad you’re getting the VIP treatment.